A sore throat is one of the most common reasons people stay home from work or their children miss school. There are several causes for a sore throat. An infection could be present, or a sore throat might be a symptom of seasonal allergies. 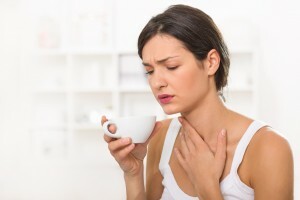 A mild sore throat can usually be treated at home without seeing the doctor. Acetaminophen, ibuprofen, or throat lozenges will often help with the pain. However, if the sore throat is severe and is accompanied by fever, a visit to the doctor is in order. A sore throat is often one of the first symptoms of the common cold. Getting plenty of rest, gargling with warm salt water, and over-the-counter pain medications will help. Colds are caused by viruses and cannot be treated with antibiotics. It is not necessary to see a doctor when you have a cold. A sore throat may be a symptom of seasonal allergies or hay fever. Scratchy throat pain or rawness can be caused by postnasal drainage. Medications that relieve allergy symptoms and congestion can help alleviate the postnasal drip. Drinking lots of water helps thin the excess mucus, and hot beverages or soups can give temporary relief for the pain. Seasonal allergies and their symptoms can often be treated without a visit to the doctor. If you find that over-the-counter medications are not sufficient, a doctor can prescribe stronger medication, a steroid nasal spray, or may suggest allergy shots. A doctor should be seen when there is a severe sore throat accompanied by a fever of 101 degrees or higher, swollen lymph glands, headache, stomach ache, or rash. A serious infection such as strep may be causing the sore throat. A rapid strep test can be performed right at the doctor’s office. Strep infections are caused by bacteria that should be treated with an antibiotic. Once the antibiotic is started, the patient usually improves in a day or two. Because strep infections are contagious, a person with strep should take the antibiotic for 24 hours before returning to work or school.